This service station is in Scotland. For Milton Park services in Oxfordshire, see Didcot. A number of restaurants as the A82 enters Dumbarton. It is known as Milton services, but some signs call it Dumbarton Gateway services, while it has been nicknamed both Gate and Dunglass. 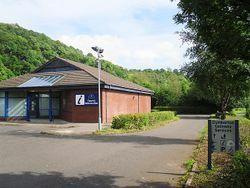 The closed tourist information centre. What's now the north-westbound services was originally a nursery. It became a pair of garages in the 1960s. The Dumbarton branch of Little ChefHistory opened here in around 1983, replacing the bypassed Clydebank branch. In 1988 it was joined by a Little Chef Lodge, now Travelodge. The Little Chef closed in January 2012, as part of a crackdown on under-performing restaurants. It was later taken over by Euro Garages, becoming a Starbucks. A former tourist information centre has since become Masala Twist. The petrol station is operated by MFG. A car dealership is accessed through the services.